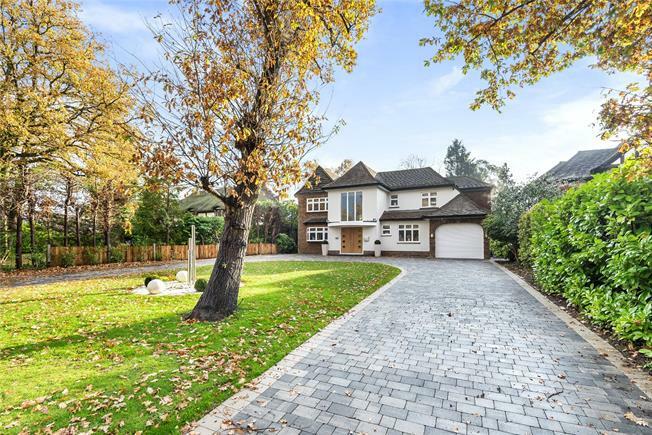 4 Bedroom Detached House For Sale in Orpington for Asking Price £1,775,000. This is a beautifully presented four bedroom detached house which has undergone significant refurbishment and extension within the last few years, in the prestigious Farnborough Park private estate with 24 hour security with private gates. This property now features a very impressive entrance hallway with contemporary glass staircase and cloakroom leading off. There is a large living room opening into dining area, office/study, fully fitted kitchen/breakfast room with substantial stone work surfaces and peninsular/breakfast table with feature bi-folding doors to rear, utility room and there a beautifully presented Amdega conservatory. The master bedroom features a dressing room, en suite shower room plus balcony and a lantern light providing more light into the room. The three further bedrooms are served by a well-appointed family bathroom. The property sits within attractive gardens to front and rear, the front driveway is an in and out and has recently been block paved, with an attractive contemporary water feature to front. Viewing highly recommended.